French Ambassador to Ukraine Isabelle Dumont has said the UN peacekeeping mission in Donbas should not contribute to the freezing of the conflict. "The UN peacekeeping mission is also a potential tool [of settling the Donbas conflict]. To have a peacekeeping mission, by definition, you need to have peace to start with that. Currently this is not the case... You need to avoid that the UN would sort of support freezing of the conflict. This is something we are extremely careful about," Dumont said during a joint interview with German Ambassadors to Ukraine Ernst Reichel with Interfax-Ukraine. The parameters for a peacekeeping mission should be defined, she said adding that she meant other issues in addition to that of its numbers. "Now there is no agreement between Ukraine and Russia about those parameters. It's not about numbers or nationalities. It's more fundamental, about what sort of peacekeeping mission there should be. Also, we are working extremely closely with the Americans in the UN Security Council," the French ambassador said. 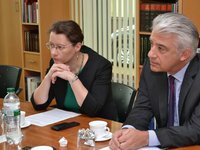 Reichel for his part said that the UN can be a useful tool in the implementation of the Minsk agreements, but there are still fundamental differences on this matter. "So far, the probe hasn't revealed that there is any change, but we will keep on going now," the German ambassador said.